"A masterpiece of social satire, featuring one of literature's best-loved characters, Becky Sharp. 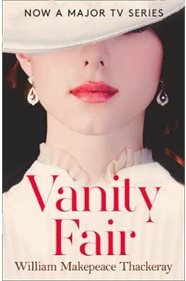 Ruthless social climber and irrepressible anti-hero Becky Sharp will do anything to raise her position in Society, from impoverished orphan to woman of means. Clever, lively and resourceful, Becky is the total opposite of her naive and sentimental schoolmate Amelia Sedley, a pampered yet good-natured girl from a wealthy family. As both women pursue love and life in London, against the background of the Napoleonic Wars, Thackeray paints a vivid portrait of decadent Regency England and satirises its corruption and flaws to delightful effect."